As the nation’s Space Transportation System, the primary goal of the Space Shuttle was just that—to transport people and cargo back and forth be­tween the surface of Earth and orbit around the planet. However, it was quickly obvious that the shuttle had even greater potential. In 1973 and ’74, the Skylab space station had demonstrated the value of conducting scientific research in Earth orbit. From the beginnings of the Space Shuttle program, plans had been that the vehicle would support a space station that would continue, and build further upon, the work done on Skylab. However, the realities of budgetary constraints meant that the two could not be developed at the same time and that the space station would have to wait. In the meantime, though, the Space Shuttle itself would provide a stop­gap measure— a pressurized module placed inside the orbiter’s cargo bay could be roomy enough to serve as an effective orbital science laboratory. by conducting a full complement of scientific experiments. According to STS-9 mission specialist Owen Garriott, who was a member of nasa’s first group of scientist-astronauts and of the second crew of Skylab, the mission of Spacelab I included experiments in biomedicine, astronomy, fluid phys­ics, materials processing, and atmospheric sciences. A rack of fluid physics equipment enabled the crew to inject liquids, shake them and rotate them, combine them and stretch them, in order to study the small forces associated with the surface tension and the even smaller forces that are associated with fluids that cannot be as easily demonstrated or measured in a one-g environment. An adjacent double rack was dedi­cated to materials science. The racks included furnaces in which material samples could be heated and resolidified. Other equipment focused light on a crystal, melted it, and then allowed it to solidify more carefully. Spec­trometers flown on the mission allowed the crew to conduct stellar astron­omy and air-glow research through the orbiter’s windows. Before the flight assignment, during the period between Skylab and shut­tle, Garriott had gone into management, becoming director of science and applications at Johnson Space Center. He was still a member of the astro­naut corps but was no longer actively involved with the Astronaut Office. 26. 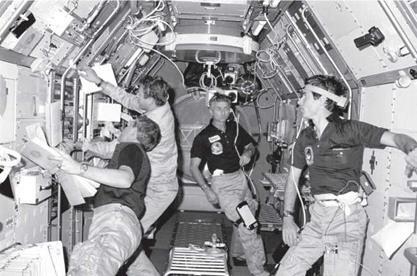 In the Spacelab on the first Spacelab mission are Robert Parker, Byron Lichtenberg, Owen Garriott, and Ulf Merbold. Courtesy nasa. Directorate until another flight opportunity came along. I’d always intended to return to the Astronaut Office full time as soon as there was the first flight opportunity available. Garriott also felt fortunate to work with the other astronauts on STS-9, including Commander John Young. I’ve always gotten along extremely well with my fellow crewmates. John Young, who was the commander of Spacelab I, is not an Alan Bean [commander ofGar – riott’s Skylab crew]. He’s motivated differently, different personality, [a] standard sort ofaprototypical test pilot. I was a little concerned about that, since we were bringing in the first foreign international. How well is that going to work? It turns out it worked extremely well, for which I give John Young a lot ofcredit. I really enjoyed having John as the commander ofour flight. And I think after we came back he had no better friend on board our flight than Ulf Merbold. They still often talk. Whenever Ulf comes back, I think they get together for dinner. While the commander’s primary responsibility in orbit was the operation of the vehicle and oversight of the crew, Garriott noted that Young made several other contributions to support the scientific portions of the mis­sion. For example, when the mounting apparatus for a camera used for a vestibular experiment broke, rather than allowing thousands of film frames to go to waste, Young took the camera and film to the flight deck and spent time taking Earth-observation photographs. sts-9 was the first nasa flight to include payload specialists, astronauts who were not career nasa employees. Ulf Merbold, the first internation­al astronaut to fly on the shuttle, was a West German astronaut from the European Space Agency, and Byron Lichtenberg was a researcher from the Massachusetts Institute ofTechnology (mit). Garriott described the feelings of the career astronauts toward the payload specialists as “uncertainty” and compared it to when his class of scientist – astronauts joined the all-pilot astronaut corps. When we came into the Astronaut Office, I can imagine that the pilots were thinking, “Geez, these old fuzz-hair university types, can they hold their own here, do they know what’s going on?" In the same way, these [payload spe­cialists] are really university types here. Are they really motivated to fly, can they hold their own, and so forth? And I very quickly found out that yes, in­deed, they could. They were on par with all of us. We were very much of the same kind of breed, in my opinion. We got along extremely well. Everybody got along fine. And after thirty years, they’re still some of my best friends. So it was a very pleasant and positive experience for both ms and ps [mission spe­cialists and payload specialists] as far as Spacelab I is concerned. I think that is generally true for most of the flights, though not necessarily in each individ­ual case. When you get up to twenty, thirty people, you’re bound to find some rough corners somewhere. I can say on Spacelab I, it was a remarkably posi­tive experience for all of us. While Garriott did not recall any resentment over payload specialists tak­ing slots that otherwise might have gone to career astronauts, he also not­ed that in the case of STS-9, the payload specialists had trained for as long as the newest nasa astronauts had been in the corps. Brewster Shaw, the pilot for STS-9, said that, being in a crew that was mostly rookie space flyers, it was interesting working with veteran astro­nauts Garriott and Young. Owen were the experienced guys, and they kind of were the mentors of the rest of us. It was fun to watch Owen Garriott back in the module, because you could tell right from the beginning he’d been in space before, because he knew exactly how to handle himself how to keep himselfstill, how to move without banging all around the other place. And the rest of us, besides he and John, the rest of us were bouncing off the walls until we figured out how to operate. But Owen, it was just like, man, he was here yesterday, you know, and it really had been years and years. at very low acceleration levels,” Garriott explained, comparing the g-forces of the vehicles’ initial accelerations to what one would experience in a car. It keeps building up a little bit, but the important thing is it’s steady. When you accelerate in a car, you accelerate for three or four seconds and then you reach the speed you want to be at. Here, you keep on accelerating. So you keep up an acceleration which is increasing up to maybe three or four gs. But it takes about eight and a half minutes, nine minutes, to get to space on either one of the two vehicles. As you lift off there’s quite a bit of vibration with either vehicle. Once you get above about one hundred thousand feet, first ofall, you stage, you switch to a smaller engine on a second stage, and you’re above most of the atmosphere so the vibration diminishes. Then it just becomes a nice steady push, and you con­tinue that push at about three to four gs, all the rest of the way till you’re into orbit. All of a sudden you’re bouncing up against your straps. So the launch is remarkably the same, in my view, between a Saturn and a shuttle. With the development, training, and launch complete, it was time for the real business of STS-9 to begin. The crew worked for twenty-four hours a day, divided into two shifts. The commander and pilot each were assigned one shift, and the scientists were split between them. Each crew member was on duty for about twelve hours, with a brief handoff between shifts. The astronauts then had twelve hours off duty, during which to sleep, eat, get ready, and enjoy the experience of being in space. 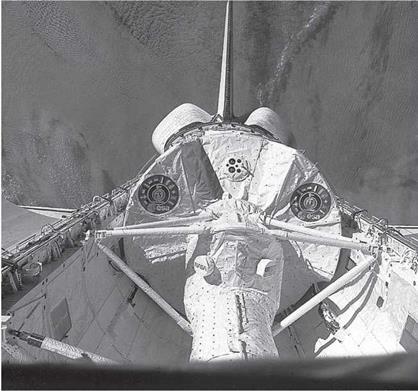 You didn’t want to leave the vehicle unattended very much, because this is still STS-9, fairly early in the program. We hadn’t worked out all the bugs and ev­erything, and neither John nor I felt too comfortable leaving the flight deck un­attended, so we spent most of our time there. We had a few maneuvers to do once in a while with the vehicle, and then the rest of the time you were moni­toring systems. After a few days of that, boy, it got pretty boring, quite frankly. You spent a lot of time looking out the window and taking pictures and all that. But there was nobody to talk to, because the other guys were back in the back end in the Spacelab working away, and, you know, you just had this, “Gosh, I wish I had something to do, " kind of feeling. I did “Helen’s balls.". . . Helen was a principal investigator, and she had a bunch of little yellow balls that were different mass. . . . Since there’s no weight, there’s only mass, in zero g we had to try and differentiate between the mass of these balls. You would take a ball in your hand and you would shake it and you would feel the mass of it by the inertia and the momentum of the ball as you would start and stop the motion. Then you’d take another one and you’d try and differentiate between [them], and eventually you’d try and rank [the] order of the balls. . . . And, quite frankly, that’s the only experiment I remember doing. For the hundreds of other people Garriott talked to in addition to those preplanned calls, he used a tape recorder to log the contacts. “Everyone I could discern answering my call, I would repeat back their call sign, as many as possible. And then I listened to every one of those tapes. And I had an­other friend go through the whole list, and we responded to everyone whose call sign we could pick out of there. So there were, I don’t know, four or five hundred people that all received a card called a QSL, that’s another special symbol that’s used by hams as a symbol of a contact between two people.” Garriott’s initiative to use amateur radio on STS-9 created a lasting leg­acy. Almost thirty additional shuttle flights carried ham radio and used it to talk to schoolchildren and other groups, allowing students to ask ques­tions of astronauts in orbit during organized events. Years later, amateur ra­dio became a fixture on the International Space Station, with its first crew conducting a ham radio conversation with a school within weeks of board­ing the station. Thousands of students have had the chance to talk to orbit­ing astronauts as a result of the amateur radio contacts begun by Garriott. That legacy paid off for Garriott himself in a very special way many years later. In 2008 Garriott’s son, Richard, became the first second-generation American space flyer as a spaceflight participant on a Russian Soyuz flight to the International Space Station. While there, Richard was able to use the equipment on the Space Station to talk to his father on the ground. As unique as that experience was, it had an even deeper personal significance for the elder Garriott. “My father and I got our ham licenses together back in 1945, and his call sign was W5KWQ. Mine was W5LNL. Now, normally, when a person dies, they reserve that for a little while, but then they’ll even­tually reissue the call sign. So after my father died, which would have been back in ’81, it hadn’t been reissued yet. So my son got his license [in 2006], and they allowed him to have his grandfather, my father’s, call sign again.” During his son’s flight, Garriott was able to respond to a contact from his father’s call sign, now used by his son. but certainly when John started to de-rotate the vehicle, it responded different­ly than he had trained on. So here we are. John’s flying the vehicle. I’m giving him all the altitude and airspeed calls and everything, and you feel this nice main gear gently settling onto the lake bed. . . . There were only two of us on the flight deck, as I recall, because we still had the ejection seats in Columbia at that time. They hadn’t been taken out, so there was no room for another seat. So. .. the other four were on the mid-deck, and you hear this, “Yay!" and clap­ping when the main gear touched the ground very gently. Then John gets the thing de-rotated and we’re down to about 150 knots or so when the nose gear hits the ground, and it goes “smash!" So it changes from this “Yay! Yay!" to “Je­sus Christ! What was that?" That was just really funny, and I got all of that on tape, because I had a tape recorder going. And poor John, he was embarrassed because of this, the way the nose gear hit down, but it wasn’t his fault. They had changed this thing without him being able to practice using the new flight control system. So that was a good lesson. The crew learned the next day that Columbia had also suffered yet an­other problem during the reentry and landing—a fire in the vehicle’s aux­iliary power units. “We had one apu shut down, and then when we shut the other two apus down, normally after landing, it turns out one of them was also on fire,” Shaw explained. The reason the first one shut down was it was on fire. . . and it automatically shut itself down. . . . The next one didn’t shut down until we actually shut it down. But there were two of them that were burning. . . . So we had a fire out­side the APUs that when we shut them down and shut the ammonia off to them, the fires went out. So we had some damage back there, but the fires stopped. The flight also had two of the general-purpose computers (gpcs) fail. “That was an interesting thing, too,” Shaw recalled. John and I were in the de-orbit prep, . . . and we were reconfiguring the GPCs and the flight control systems and the rcs [reaction control system] jets and stuff. . . . About the time that we were reconfiguring the computers, we had a couple of thruster ^firings, and the big jets in the front fired and it’s like these big cannons—boom! boom!—and it shocks the vehicle. You know, you really can feel it if you’re touching the structure. So we had one of these firings and we got the big “Xpole fail” on the CRT, meaning the computer had failed. This is the first computer failure we had on the program. Our eyes got about that big. So I get out the emergency procedure checklist and. . . we started going through the steps and everything. And in just a couple of minutes we had another one fail the same way. . . . So now we were really interested in what was going on. We ended up waiving off our de-orbit at that time. . . . The ground decided, no, we’re going to wait and try to figure out what’s going on with these computers. When Young’s shift ended, with nothing more he could do to address the problem and wanting to be rested for the landing, he went down to the mid-deck to take a nap, leaving Shaw “babysitting” on the flight deck. Well, during that timeframe, all of a sudden there starts this noise, bang, bang, bang, bang, bang, bang, bang, bang. The next thing, one ofour three imus [in­ertial measurement units] . . . failed and we couldn’t recover it. It turned out its gimbal was failing and it was beating itself to death against the gimbal stop, and that was the banging noise. After a few hours, John comes back upstairs and says, “You know, I really appreciate you guys making all that banging noise when I’m trying to sleep down there. ” I said, “Jeez, John, I’ve got some bad news. Man, we lost an imu. ” And John’s eyes get this big again, because we’ve had two gpc failures and now an imu failure. Anyhow, we got through all that and we entered and landed, and when the nose gear slapped down, one of the gpcs that had recovered failed again. One of them didn’t recover and we flew down with one less computer, but that computer failed again, and that’s why I reconfig­ured flight control systems, as I remember now, because of that computer failure. Gregory found it interesting that the overwhelming majority of his train­ing was for a very small part of the mission. Over three-fourths of his train­ing focused on the eight and a half minutes of launch and hour of entry, out of a week-long mission. While the proportions may have seemed odd, it was necessary to make sure the flight deck crew was ready to perfectly ex­ecute the tasks required of it no matter what happened. It’s like a ballet, you know, without music: individual but coordinated activities that resulted in the successful accomplishments ofeach of these phases, regardless of the type offailure or series offailures that this training team would impose on you. So that’s what we trained for. There were two thousand or so switches and gauges and circuit breakers, any number of which we would involve ourselves with during these two phases, ascent and entry. So the intent was for us to learn this so well, understand the system so well, that we could brush through a failure scenario and safe the orbiter in the ascent such that we could get on orbit and then have time to discuss what the real problem was and then allow you to correct it. Eventually, it was time to move from the simulations to the real thing. As with sts-9, two shifts worked around the clock. “While each shift worked, the other shift slept,” Gregory said. We had enclosed bunks on the mid-deck of the orbiter, and that’s where the off shift would sleep, so we never saw them really…. Each shift had its own area of interest, so there was really no competition between the two of them. . . . There were really about four hours a day there was an interaction between the two. It would be the two-hour postsleep transition, when one is just waking up. A shift is waking up, and they are picking up the ball, so to speak, from the other shift. The other shift then prepares to go to bed. We had the first laboratory animals in space, and Bill Thornton had to wor­ry about them on one shift, and Norm would worry about them on the other shift. . . . We had two cute little squirrel monkeys and twenty-four less-than – cute laboratory rats. 27. The Spacelab in the cargo bay of the Space Shuttle. Courtesy nasa. The squirrel monkeys adapted very quickly. They had been on centrifuges. They had been on vibration tables. So they knew what the roar and the feeling of space was going to be like. Squirrel monkeys have a very long tail, and ifthey get excited, they wrap the tail around themselves and hang on to the tip of the tail. Ifthey get really excited, they chew on the end of their own tail. By the time we.. . activat­ed the laboratory, which was about three hours after liftoff they were now adjust­ed. They had, during liftoff apparently chewed off about a quarter of an inch of the end of their tails, but they were adjusted and just having a ball. I kept saying, “Let’s let one of them out." “No, no, cant do that. We’d never catch him again." Gregory noted that he and Overmyer had the “privilege” of helping with the monkeys at one point, doing cleanup work capturing debris from the food and waste escape in the holding facility. These rhesus monkeys that we had were extremely spoiled. I think that the en­vironment that they had come from before they came on the orbiter was a place where they received a lot ofattention from the caregivers there. Norm and I would look back into the Spacelab, and we would see Bill Thornton attempting to get these monkeys to do things, like touch the little trigger that would release the food pellets. And I could tell. .. watching them that they expected Bill to do that for them. So we looked back there one time, and we could see that kind of the roles were reversed, that Bill was actually doing antics on the outside of the cage and the monkeys were watching. We almost joked sometimes that they started laugh­ing, and they went back and ate. It was an interesting dynamic to watch Bill Thornton wrestle with or react with the monkeys. It was quite an act back there. Lind recalled that the substantial amount of automation involved in the Spacelab experiments provided him with a unique opportunity to do an ex­periment of his own. When he realized that a good bit of his duties would consist of regularly checking on automated equipment, he and a partner proposed an experiment to look at the aurora from space. Prior to his mis­sion, the aurora had been photographed from space by slow-scan photom­eters, which give a blurred picture. On Skylab, Owen Garriott had taken a limited number of photographs of the aurora on the horizon. “There were a few pictures, but not many,” Lind explained. So Tom and I started thinking about how we could do this. The first thing we wanted were high-time-resolution pictures of the aurora made with a TV cam­era. So we started looking around. What TV system could we get that would be sensitive enough in such a low light level? It turned out that the tv camera that was already on the Space Shuttle was as good as any TV camera we could have bought in the world. But we had to take off the color wheel and photograph in black and white instead of color. So we asked and got one of the TVs modi­fied. Because [we would be doing that only] in black and white, you want to take some still photographs in color to document what color the auroral light is, since that will identify what particles are emitting the light. So we started to look around for an appropriate camera and camera lens. It turned out that the camera that we already had on board and the lens we already had on board were, again, as good as we could have gotten anywhere. NASA only had to buy three rolls of film, special, sensitive color film. So this experiment cost NASA thirty-six dollars, and it’s the cheapest experiment that has ever gone into space. It was very satisfying to us that we made some discoveries on thirty-six dollars. We claimed that we could do more science per dollar per pound than anybody else in the space program. The experiment proved to be not only cheap, but also effective, revealing a new component of aurora formation. Despite the busy shift schedule and the additional experiment Lind had proposed to fill the extra time, he eventually found some time to appreci­ate the view from the orbiter’s flight deck windows. It was like a Cinerama presentation. Both my wife and I are amateur oil paint­ers. … I thought, “Could I ever paint that? "The answer is absolutely not. Grum – bacher [art materials company] doesn’t make a blue that’s deep enough for the great ocean trenches. You look out tangentially through the Earth’s horizon, and you see—I was quite surprised—many different layers of intense blue colors, about twenty to twenty-two different layers of cobalt and cerulean and ultra­marine and other shades, and then the blackest, blackest space you can imag­ine. When you go over the archipelagoes and the atolls and islands in the Pa­cific and down in the Bermudas, you see the water coming up toward the shore from the deep trenches, and it appears as hundreds of shades of blue and blue green up to a little white line, which is the surf, and another little brown line, which is the beach. Nobody will ever paint that. It’s magnificent. Lind was so overwhelmed by the beauty of the view that it brought tears to his eyes, which he discovered was also a very different experience in orbit. In space, tears don’t trickle down your cheeks; that’s caused by gravity. In space the tears stay in the eye socket and get deeper and deeper, and after a minute or two I was looking through a half inch of salt water. I thought, “Ooh, this is like a guppy trying to see out of the top of the aquarium." Simultaneously with this, there’s this sense of incredible beauty. But then I had a spiritual feeling, be­cause several scriptures popped into my mind. You know, the nineteenth Psalm, “The heavens declare the glory of God." One of the unique Mormon scriptures is, “If you’ve seen the corner of heaven, you’ve seen God moving in his majesty and power." In the book of Romans, it says that the righteous will be coinher­itors with Jesus Christ of all this. I thought, you know, “This must be the way the Lord looks down at the Earth." Because from space, you cant see any gar­bage along the highway. You cant hear any family fights. You see just the beau­ty of how the Lord created this Earth, and that was a very spiritual, moving experience, along with the aesthetics, the physical beauty. I’ll always remem­ber that special feeling, besides the technical satisfaction of a successful mission. The third Spacelab flight, 51F, was commanded by Gordon Fullerton, marking his return to space after serving as pilot of the final demonstration flight, sts-4. “It was a great mission,” Fullerton commented. It really was. Some of the missions were just going up and punching out a sat­ellite, and then they had three days with nothing to do and came back. We had a payload bay absolutely stuffed with telescopes and instruments. We had the instrument-pointing system that had never been flown. We had the idea of let­ting a satellite go and then flying this precise orbit around it and then going back and getting it. So, all kinds of new things, which took a lot of work to write the checklists for, write the flight plan, and so we spent a year and a halfdoing that. After all the preparation, the mission had a rather inauspicious begin­ning. All three Space Shuttle main engines lit properly on schedule seconds before the scheduled launch, but then one failed before the solid rocket mo­tors were ignited, leading to a launchpad abort. “Karl Henize was pounding on his leg, really mad because he didn’t get to go,” Fullerton recalled. I turned around to Karl and said, “We don’t want to go, Karl. There’s some­thing wrong out there, you know. " We were worried then: is this going to. . . mess everything up? It did to some extent, but the ground worked overtime, be­cause everything was sequenced by time because it’s an astronomy thing. Wheth­er we’re on the dark side or the light side, all that had to be rewritten. And it all worked out great. We even made up for the fuel we’d had to dump because of the engine failure on the way up [on our second attempt] and eked out an extra day on it. We were scheduled for seven and made it eight. Once on orbit, the crew followed the established Spacelab pattern of working twenty-four hours a day, in two, twelve-hour shifts. “I anchored my schedule to overlap transitions, so if something came up on one shift, I could learn about it and carry it over to the next shift, hopefully,” Ful­lerton recalled. But I also had to stagger things so I got on the right shift for entry, so I was in some kind of reasonable shape at the end of the mission. At the beginning, too, we had the red team sleeping right up till launch time so that once we got on orbit, the red team was the first one up, and they’d go for it for twelve hours. So it was all that kind of thing, juggling around so that the right people that had to be alert for launch and entry were. We got into that circadian cycle prior to launch. So the last week they didn’t see the other team; I only saw part of one and part of the other myself. Compared to his first mission on a two-person demonstration flight, the presence of a larger, seven-member crew this time around had down­sides as well as benefits. The pressure is higher when you’re commander—the pressure of making sure that not only you, but somebody else, doesn’t throw the wrong switch. With Jack and I, it was just the two of us. He only had to worry about me, and I him. We could double-check each other. With seven people, there are many opportunities for somebody to blow it, not to say instant disaster, but to use too much fuel or to overheat some system or not have the right ones on and blow the chance to get this data. . . . That’s a lot of other people throwing switches, too. In addition to the responsibility of supervising the crew’s actions, Fuller­ton found many other pressures involved in the role of commander. During the entry, there was the pressure, [of] it’s your fault if this doesn’t come out right. When you’re in the [pilot’s] right seat, it’s not all your fault. The com­mander bears culpability even if you make a mistake. I’m dwelling on this pres­sure thing because that really is a strong part of the challenge. I mean, you’re really tired after spaceflight. I think you’re tired mostly because you elevate your­self to this mental high level of awareness that you’re maintaining. Even when you’re trying to sleep, you’re worried about this and that. So it’s not like you’re just lollygagging around and having a good time. You’re always thinking about what’s next and mostly clock watching. Flying in orbit is watching a clock. Every­thing’s keyed to time, and so you’re worried about missing something, being late. The mission featured another historic footnote. In the mid-1980s the “Cola Wars” between competing soda brands Coca-Cola and Pepsi-Cola were in full swing, and on this mission the competition moved into space. Each company attempted to find a way to dispense its beverages in micro­gravity so that astronauts could drink them on the shuttle. Gravity plays an important role in the proper mix of carbonated sodas, and in microgravity the carbonation separates. The goal was to create a device that would en­sure the beverages were properly mixed as they were consumed. Ultimate­ly, however, the unique factors of the near-weightless environment limited the success of both attempts. Astronaut Don Peterson, who had already left the astronaut corps at the time, recalled an incident during the 51F flight that demonstrated just how many people it took to make the shuttle successful, including a large number of people who never receive any recognition. “I remember, this. . . was one of the flights that Story Musgrave was on, because he and I were friends and I was kind ofwatching. During launch, they got an indication from instrumen­tation that one of the engines on the orbiter was overheating; . . . it was over­pressure or overheat, something, and they shut it down,” Peterson remembered. Mission Control Center and this is happening in real time. You’ve [got] to re­alize, this sucker’s up there burning away and you’ve got people, human be­ings, on board and all that. She looked at that and said, “I don’t believe we’ve got two engine failures on the same flight. That’s highly improbable. I believe we’ve got an instrumentation failure. Don’t shut the engine down. " Now, in hindsight, that was a wonderful decision, but had she been wrong, the back end of the vehicle would have blown out and killed everybody on board and lost a shuttle. While the woman’s decision saved the mission, she received little recogni­tion for her split-second call, outside of nasa insiders closest to the situation. Of course, the flight crew and all us people thanked her profusely, and she was recognized, but I don’t think she ever really got any public recognition for that at all. But, I mean, that’s a life-or-death decision under tremendous pressure with. . . human beings and a two-and-a-half-billion-dollar vehicle. And you can’t get under much more pressure than that, and she called it right. What I did to her was terrible. I called her up later. I waited about a month and called her up and said, “I’m Robert Smith, and I’m a reporter with Life magazine. I understand that you’re the woman that saved Story Musgrave’s life." And there was this long, long silence. And finally she said, “Who the hell is this?" Story has a reputation as a lady’s man. So she kind of got a kick out of that, I think. The fourth Spacelab flight, 61A, was yet another mission that introduced new elements to the shuttle program by building on its predecessors, par­ticularly the first Spacelab flight. STS-9 had been distinguished from previ­ous shuttle missions in part for carrying the first European crew member, West German astronaut Ulf Merbold. If STS-9 had been a further step to­ward international spaceflight, 6ia was a leap—a mission purchased by and dedicated to the work of a foreign country, West Germany. Commander Hank Hartsfield recalled explaining to a West German reporter the circumstances of Germany paying to use the German-built Spacelab module. “He said he wants to know how much Germany has to pay the United States to use their Spacelab, because Spacelab was built in Germany. It was built in Bremen. They were very sensitive about it. I think Germany had paid eighty million dollars for that flight. But this report­er was taking a very nationalistic look at it: ‘We built it and now we have to pay to use it.’” Hartsfield explained that what the reporter failed to un­derstand was that, while West Germany had built the modules, it did not own them. The first Spacelab module West Germany built, lmi, was given to the United States in exchange for flying Payload Specialist Ulf Merbold and experiments, and the second, LM2, was purchased by nasa. For example, one of the biggest controversies Hartsfield remembered is what language would be used on the mission. The multinational nature of the crew popped up in various and inter­esting ways, from the larger issues that led to the “delicate negotiations” to more trivial and potentially amusing incidents, Hartsfield recalled. The mission was the first to be partly directed from outside the Unit­ed States. Germany had built its own control center in Oberphaffenhofen, southwest of Munich. Yet another of the interesting cultural differences came to light during a visit by the crew to the control center during mission preparations. “They had an integrated sim, the first one they’d run, and the whole payload crew was over there working in the simulator and doing this sim to get their controllers up to speed,” Hartsfield recalled. Well, they were also filming a documentary on how Germany was preparing for this thing, and so there were camera crews walking around in their control center taking pictures, and it got to be lunchtime. Things are different in Ger­many, you know, about drinking. To have wine and beer at lunch is a common thing. Well, in the basement of the control center, like in a lot of German busi­nesses, they’ve got machines like Coke machines, but it’s a beer machine. The flight controllers had all gone down and got a beer, and here is this crew, all of them got a beer, sitting on the console, and eating lunch. I called Hansulrich Steimle, and I said, “Hansulrich, I know how things are here in Germany, but you’re filming for posterity here. ” I said, “If this film goes outside of Germany, some people may not understand your flight controllers drinking on duty. ” Then I became very unpopular, because some of them knew that I had said something, because he made them put their beer away. The cultural differences were particularly an issue during mission prep­arations for Bonnie Dunbar, the only female member of the crew. As the two nasa mission specialists, she and Guy Bluford were sent over early to begin training in West Germany. When I showed up there was a lot of discussion about both of us, but, with re­spect to me, they were very concerned that I had been assigned to the flight, be­cause their medical experiment wasn’t intended to include female blood. They thought that would ruin their statistics. . . . I was actually told in front of my face—and I have to first of all qualify that I’ve become very good friends with all these people; but any time you’re at the point of the pathfinder, there’s going to be things happening—I was told that maybe NASA had done this intention­ally to offend the Germans by assigning a woman. However, Dunbar also had many positive experiences working with the West Germans in preparation for the mission and enjoyed their excitement about it. She began working with the Germans during preparations for the first Spacelab flight, and she said it was fun to see the atmosphere there dur­ing their entry into working with human-rated vehicles. When I went over there, it was a very exciting time for them. The Bundestag had become involved in this, which is their legislative government. At that time the seat of government in [West] Germany was in Bonn, and were training in Bonn/Cologne. So it wasn’t unusual for our two German astronauts, Ernst Messerschmid and Reinhard Furrer, to have lunch with what we’d call a sena­tor. There was just a lot of interest. The mission manager at that time told me that they hoped to use this mission not only to advance their science and human spaceflight but to inspire a generation of young people in Germany that real­ly hadn’t had inspiration since the war, and they lost the war. So this had very much a political flavor to it, not just a scientific flavor to it. According to Dunbar, the German astronauts were great to work with, and it was very interesting being around them in West Germany, where they had a respected, heroic status. Actually, it was fun to talk to them, because in Germany they very much oc­cupied an Original [Mercury] Seven status, and so it was always interesting to hear from their perspective and see what they were doing, how the program was being received. It’s changing now, but there’s still a lot of dichotomy, even in Germany, about the value ofhuman spaceflight, even though they’re a major partner in esa [the European Space Agency] and in the Space Station, because there would be one or two ministers that would vocally try to kill the program, and so we were interested in working with them and helping them. Hartsfield recalled several highlights of 61A once the preparations were complete and the flight was finally underway. “I would say it was probably the most diverse mission ever flown,” Hartsfield asserted. We had a black, a woman, two Germans, a Dutchman, and a marine. I mean, how diverse can you get, you know? And there was some funny things hap­pened. We launched on October 30, and of course, October 31 was Halloween. So I took a back off one of the ascent checklists we weren’t going to use anymore, and I drew a face on it, cut out eyeholes, got some string, and I made myself a mask. I took one of the stowage bags and went trick-or-treating back in the lab. Of course, they don’t do Halloween in Germany, or Europe, so they didn’t know what I was up to. I decided not to pull any tricks on them, but I didn’t get much in my bag. But somebody took a picture. One of the guys took a pic­ture of me with that mask on, holding that bag, and somehow that picture got released back in the U. S. About a month after the flight, I got a letter from NASA headquarters. Actually, the letter had come from a congressman who had a complaint from one of his constituents about her tax money being spent to buy toys for astronauts. She was very upset. So it was sent to me to answer, and I had to explain, hey, nothing was done, and it was made in flight from mate­rial we didn’t need anymore. It was just fun. I never heard any more, so I think maybe that satisfied her. She had the notion that we had bought this mask and bag and stuff just to do Halloween. Another amusing anecdote Hartsfield recalled involved Bluford. Steve [Nagel] and I were up on the flight deck. All of a sudden, we heard this bang, bang, bang! It sounded like somebody was tearing up the mid-deck. We peeked our heads down in the hole on the side where the bunks were. About that time we saw the bottom bunk come open, and the top one. Bonnie is stick­ing her head out looking up and Ernst is looking down, and all this banging is going [on] in this little bunk. So they slide Guy’s door open to his bunk, and he kind of looks around, “Oh," and he pulls it back shut and goes back to sleep…. Apparently, he had awakened and didn’t know where he was. He had a little claustrophobia or something, and he was completely disoriented, you know. But when he finally saw where he was, he said, “Okay," and he went back to sleep.